planning a morning meeting? We've got you covered. On this note, we at 41 Portland Place decided to add some motivation to the early hours of your Thursday commute: a breakfast showcase. What’s that you say? 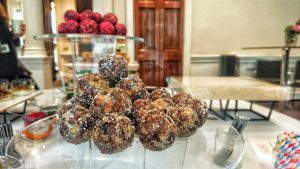 Well, we opened our doors to those who might fancy having a peak round our Georgian Townhouse and rewarded them with a variety of healthy breakfast nibbles, hoping to start their day (once the caffeine from our lovely barista coffee kicked in) with a smile! So what happens at a breakfast showcase? Well, our pick-me-ups included ‘carry rounds’ of morcilla lollipops, pistachio crumb and smoked ketchup; bowls with maple-smoked pork belly, kim chi pancake, gouchong mayo and fried egg; and a ‘Grain Store’ full of raw energy balls, granola and a variety of yoghurts. With this showcase we premiered our newly refurbished spaces: The Curie and Franklin meeting rooms. 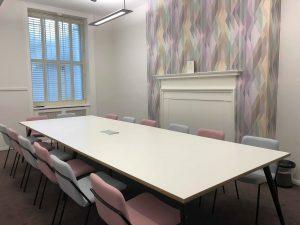 Decorated with a Scandi touch, these room are available for either boardroom style, or a casual meeting space. With no minimum catering spend, the room rate includes unlimited Eros Fairtrade coffee and a selection of teas and full access to our chef’s selection of sweet and healthy snacks available for breakfast, mid-morning and afternoon from our Boardroom Pantry. All of our food is prepared freshly on-site, and we are sticklers for keeping things exciting. 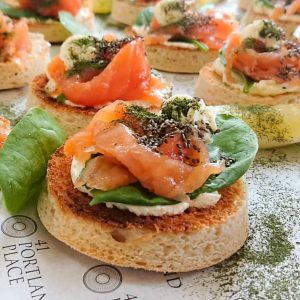 We can create bespoke catering for your morning meetings such as our showcase tasters, and even if you just come to us with a glimmer of a concept, we are quick off the mark to help develop your ideas into reality. So booking an early morning meeting? Want to add a bit of sparkle to the meeting registration and start any day (even a Monday), with a productive snap? Email us on: enquiries@41portlandplace.com or call 0203 141 3255 to see if we can make mornings great again!